Cosimo III de' Medici, Grand Duke o Tuscany (14 August 1642 – 31 October 1723) wis the penultimate Grand Duke o Tuscany. He reigned frae 1670 tae 1723. He wis a member o the Hoose o Medici he mairit Marguerite Louise d'Orléans, a first cousin o Keeng Louis XIV o Fraunce an haed childer. Ferdinando de' Medici, Grand Prince o Tuscany (b.1663 d.1713) mairit Violante Beatrice o Bavarie, nae childer. Anna Maria Luisa de' Medici (b.1667 d.1743) mairit Johann Wilhelm, Elector Palatine, nae childer. Gian Gastone de' Medici, Grand Duke o Tuscany (b.1671 d.1737) mairit Anna Maria Franziska o Saxe-Lauenburg, nae childer. 14 August 1642 – 23 May 1670: His Highness The Grand Prince o Tuscany. 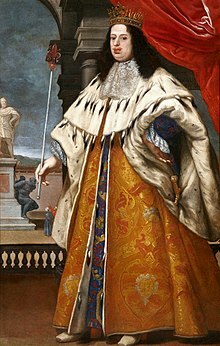 23 May 1670 – 5 February 1691: His Highness The Grand Duke o Tuscany. 5 February 1691 – 31 October 1723: His Ryal Highness The Most Serene Grand Duke o Tuscany. This page wis last eeditit on 17 November 2018, at 23:13.